One fails as a scientist if one cannot not replace a name such as ‘Pluto’ with increasingly accurate properties of what we now call the dwarf planet Pluto. But this has never been the case in the arts. We do not understand a painting by Picasso by discovering an ever-lengthening list of true facts about it. The goal of art is not to create paraphraseable imagery, but to create something to which no paraphrase ever does justice. I agree that great Art produces something whose imagery is not paraphraseable, "something to which no paraphrase ever does justice" but I doubt this is the goal of Art, but rather the effect of a great work of Art. Art to my mind can never be understood by a simple list of facts, but I think that's in part because what we experience in such works as such is not fully paraphraseable, there's always more that can be said or is felt. Great works of art exert power that is not diminished over time, power that goes beyond the normative bounds of any observer. I think this is only possible if force of these works reaches certain objective truths about the world that, if we have sufficient knowledge and emotion, can't be avoided because their power consists in their spontaneous ability to continue to generate new or deeper thoughts, newer more meaningful narratives in observers. What do you think the goal of a work is? Art is simply a social trait that enables one to acquire resources, mates and friends - which is why we do most of the weird social things we do. To make us better people. To communicate quality. If this is your understanding, Cavacava, can you explain why art is not paraphrasable? As much a something as anything else. I don't think artworks provide discursive explanations of what they are. The aesthetic effect we experience from certain works of art describe a spectrum of experience which is not amenable to discursive explanation because it expands beyond our typical conceptualization of the subject by opening new ground and expanding our conception of what the subject entails . The experience of art , the aesthetic effect is lost in any attempt at interpretation of what is experienced. If there is no remainder, nothing left out of the explanation then what is explained is not a work of art. Art as expression creates narratives which intersect with existing narratives either negatively or positively, the movement is dialectical. It is only by negation of existing meanings in art that new meanings can be experienced, and our notions can be expanded. Kandinsky's abstractions are not based on representations of the exterior world, they are interpretations of an interior world of feelings/values/meanings, which sets him apart from other abstract artists such as Picasso or Mondrian. I don't think that great works of art are simply things, rather I think they pull things out of simple material existence into processes, or ways of experiencing which if you can catch their vibe separates them from other experiences. The "goal" depends. The conscious goal of the artist? Sometime's there isn't one. The metaphysical telos of art in general? Big shoes to fill, no? I like what Berdyaev said about art, paraphrasing: "art wants to create actual being, but fails." Art has the divine creative urge, to create being itself. Laughable or controversial, maybe, but real. Even for myself, my motives for making art depend. I will say, in leu of the Witty quote I just posted to the TPF Quote Cabinet, that the music I've made that I found to be the most personally satisfying and cathartic was the work that was the most personal and honest, as cliche as that is. The personal goal, for me, of making music is to go deeper and deeper, both into myself as I evolve (or devolve), and also into the medium that I have available to me. To explore my own being concurrently with exploring the medium, and to explore how the two interact, and how they interact with the world. All of this is a product of the world around me; the world and the life I find myself in dictate how I respond to the medium, and to what extent I can go into myself to pull a piece of myself out and transform it into something. I can understand how art if understood as semblance fails to create actual being, that's why Plato kicked the imitative arts out of his Republic, but if an artist composes a song with lyrics and melody, a work of art, doesn't that song have actual being? and does not remain a glove without a hand. Yes "If you are unwilling to know what you are, your writing is a form of deceit." and yes, "All of this is a product of the world around me; the world and the life I find myself in dictate how I respond to the medium, and to what extent I can go into myself to pull a piece of myself out and transform it into something"
Kandinsky and Wittgenstein seem to bring ethics into the goal of art, the duty that one owes to one's art as one of its devout practitioners. So then perhaps a goal of art is to produce ethically authentic works, that further our understanding of truth because they can enable observers to experience a facet of the artist's self which is consciously or unconsciously transformed and presented in the work of art. An artist's job is to give the seed of inspiration what it needs to come into this world. Once the baby has arrived, the artist gives it up to the world to go out and find independent life in other souls. I like your analogy, Do you think that inspiration is independent of the artist that becomes inspired; that perhaps the artist's insight is already shared in the artist's community and that the artist through his/her sensitivity and skill enables a synthesis of existing ideas which are presented in a novel manner in the work of art. Yes, it appears as something independent. On reflection, it's apparent that an artist's time and place are part of the medium in a way. It puts an interesting slant on "artistic community" to think about artists who worked alone throughout their lives. 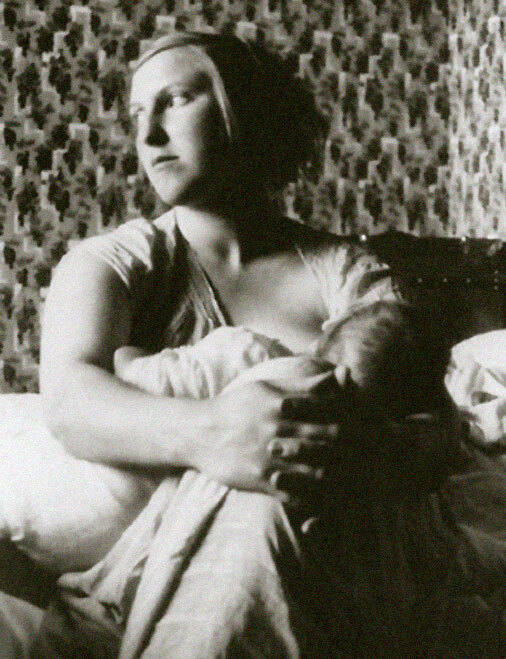 The ones I know of all happen to be women: Vivian Maier, Emily Dickinson, and Hilma Klint are some that I think of as biggies who were loners. It's interesting to compare Hilma Klint to Kandinsky. I don't know that much about Hilma Klint, however looking at her works, all those circles, reminds me of all those squares Mondrian painted. Kandinsky wrote a theory of his work published in 1912 "Concerning The Spiritual In Art"
Unlike most abstract artists Kandinsky did not look to nature or the universe for inspiration, he looked inside himself and gave expression to his interior feelings, emotions, what he suggests is the pure or essential pictorial plane, and he did this by means of the figurative, the external, which for him is the non-essential plane. They may have worked alone, but no one can fully isolate themselves from society, they have to be raised by someone, go to school and learn. Yes they can become eccentric, and perhaps by in being so isolated they can see further and clearer than those who are so fully enmeshed in society that it is impossible for them to have such a point of view. True. Would you say the meaning of a piece of art is public in the same way the meaning of a statement is? There are cultures where that's how art is understood. A Chinese watercolor painting can be clearly translated into words. Science explores the universe and things in it. Art does not explore itself, that's the consumption of art (some art is surely self-exploratory, however), like science it tends to explore the universe and things in it. Some art may be hard to paraphrase, but its meaning has finite strokes. No, study of a single Picasso does not reveal ever increasing detail because the Picasso itself is a limited study of something else. If we're forced to compare art to science, it's hard to speak to its "goals" as the goals of scientific endeavors are varied (it is not merely the pursuit of knowledge). Likewise the goals of artistic endeavors are many. A scientific work yields descriptive and predictive power over the physical world by making rigidly defined and testable statements in procedural fashions. Artistic works can also yield descriptive and predictive power over things in the physical world, but they tend to do so without the organization, consensus, and rigidity which science demands as prerequisite. Good science describes relationships that are hard to reduce. Good art says things which are hard to paraphrase. I think good art is indeed good because it "says something" that is difficult to compress or is very specific. In the case of Picasso, by distorting and removing so much, what remains is brought into greater focus.. Good art reveals, and it does so with ineffable style by using clever compositions of imprecise language. They say a picture is worth a thousand words, but how many words can a Picasso fetch? In high school I had a very talented art teacher who showed us his magnum opus which was a hyper-realistic painting of an old row boat tied to a dock. It was so realistic that I could not distinguish it from a photograph. Here was a work of art completed with more organization and rigidity than most other artworks, but he was almost ashamed of it and now I can gather why: it said little to nothing of value or intrigue. It was a painting imbued with skill beyond what I can fathom, and really that was the only remarkable thing about it. It's language was too precise. A grainy black and white photograph would have stated more. What reveals more about the world and is harder to paraphrase, a photograph of a person or Picasso's portrait of them? In describing the photo, we would have a long list of details, and in describing the Picasso we might also need to list all the details which have been intentionally warped and omitted. It's kind of paradoxical that a photograph contains more information than a painting, generally (Picasso could probably have done what he did working from photographs to begin with) but a good painting even from a photograph can mean so much more. Photos tend to contain more data, but good art simplifies to magnify, making them more interesting and meaningful. Science is the same way though: we observe vastly mixed phenomenon and try and bring fundamental parts and relationships into focus. Science seeks to highlight by simplifying and magnifying. A painting is generally more interesting than a photo because the painting makes commentary. The commentary of the painting might be contained in the photograph but discerning it would require the lens of the artist (additional data perhaps). So to conclude, good art says more with less. It trims detail into a kind of negative space where it becomes ambiguous, and what remains therefore becomes the object of focus. Often times we do not have suitable language for the things artworks communicate. The beauty of life, the curves of nature, the hubris of man. Such specific and contextual (lacking better terms) concepts and experiences are sometimes most efficiently expressed through a non-verbal medium, and if a work of art efficiently communicates a perception or notion I find worthy or interesting, I'll call it good art. But I'm reluctant to discount prose; A picture can be worth a thousand words but a well written book can be worth thousands and thousands of pictures. I am not sure I understand here. Is it because he is imitative in the way Plato suggests in the Republic or do you mean that Picasso always founds new ways of presenting what he had previously presented. Yes, I wanted to bring that up, I don't agree with Harman that there is a finite interpretation, in fact I would strenuously argue against any finite limit, as long as there are humans there will be arguments about what is the correct way to interpret. I think the reason why masterpieces are masterpieces is because they continue to strongly affect their observers. 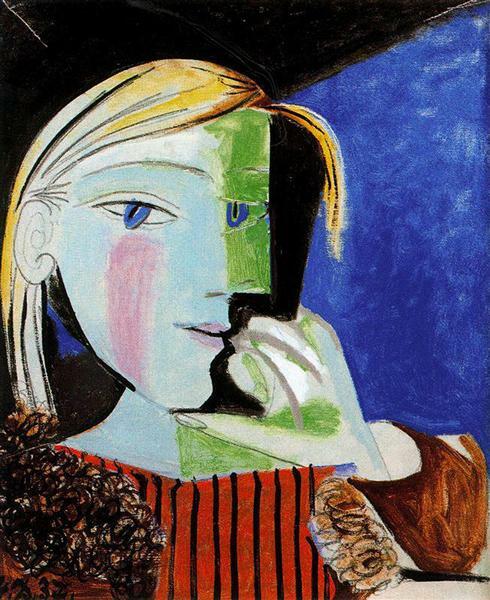 What reveals more about the world and is harder to paraphrase, a photograph of a person or Picasso's portrait of them? The photo and the portrait are both mimetic, in a photo time is frozen as it presents a reality which as you indicate presents much more detail and more information. Yet it is still a simplified reality, since it presents a 3D object in 2D. The portrait distorts her face providing an overt commentary (to use your word) prior to any interpretation. Simplifying it as you suggest. While the figurative elements in the artwork may be simpler than the photo, the art work presents a much deeper view of the character in the portrait. It goes beyond the surface to the invisible in a way that is very difficult to replicate using a camera. So then perhaps a goal of art is the communication of a way of understanding/experiencing by means of simplification and stylizing of its object. What I mean to say is that a single painting or work of art might be analogous to a single scientific detail like "dwarf" in "dwarf planet". Comparing science to the study of a single artwork instead of the on-going body and process as a whole seemed vastly unfair in the analogy. The additional context makes it clear that its point was not to produce this effect, but I think my objection might be down to the authors somewhat loose usage of the terms art and philosophy (Do we define art/philosophy by specific products? By their processes? Their goals?). As he reassures us though, the issue is of mere taxonomy. This definition resonates very strongly with what I consider to be good art. In addition to this, art which invents complexity which is not there in the first place (instead of simplifying and focusing), the dreaded abstract art, tends to say nothing at all by obfuscating and randomly distorting until all tangible meaning is lost. Anti-art. I see now that Harman doesn't claim that art is not paraphrasable. He merely says that art may be created that "no paraphrase ever does justice." Quoted in my opening post and you quoted in your response to me. I didn't deny this only that I don't think it is art's goal. You said art's goal is to "To communicate feeling/value/meaning. ", and I wonder how such a goal differentiates it from other human endeavors which also attempt to communicate feeling/value/meaning? So the butcher, the baker, the cobbler, the culter, the chef...don't have an aesthetic? Isn’t the aesthetic of an artwork something different? It serves no utility, unlike the work of the other artisans you mention, Cava. Yes, that's my point. What's your answer ND? Sorry missed the utility part...does the whole exist for the benefit of the parts or do the parts exist for the benefit of the whole, where is the utility? I don't have an answer, necessarily, in regards to the artisan. I suppose the "whole" of a loaf of ["whole-wheat"] bread is the nutrition and sustenance. Some parts of that are the flavor and texture, and the aesthetic of what the loaf looks like. Is it a cheap mass-produced loaf from the supermarket? Is it a fancy, expensive artisan loaf with perfect little crevices and colors? Was it an imperfectly shaped loaf made at home by someone who loves you? These are all aesthetic considerations of the loaf. Is that what you're getting at? If so, I'd say the parts serve the whole, when it comes to the utilitarian artisan. The parts still have value in themselves, though. But it's not clear to me when it comes to a painting, or a piece of music. What is the "whole" here? I don't know. The artwork doesn't have a clear utility (nutrition). Nutrition of the spirit, maybe? An attempt to create "actual being" that fails? By the way, I don't think I responded to your response to me, sorry. I'm too lazy to drag up the Berdyaev quote, but my understanding is that by actual being (that was a paraphrase), he meant Being, capital B, in a philosophical sense. I interpret it as the creative urge as a literal urge to create Being in the way the divine ("God") created being (thats the worldview Berdyaev is working from). And that urge is always a failure. I should drag up the quote because it's hard to wrangle with. The word ''art'' is very vague but I think art is a medium of expression. The message may be everything under the sun and the medium too has a similar range. What you want to say and how you want to say it. These are all aesthetic considerations of the loaf. Is that what you're getting at? If so, I'd say the parts serve the whole, when it comes to the utilitarian artisan. The parts still have value in themselves, though. I agree that "the parts serve the whole", that the parts are the means to an end, that their utility is only realized by the whole or end. In a similar way, water, yeast and flour are essential parts for making a loaf of bread. These parts at the immanent level of composition are purposeful. These parts, again similar to a loaf of bread, are transformed in the process of composition into a whole which is categorically different from the parts. At the level of the whole, a loaf of bread sustains life, utility at this level is different from the composition utility that made it, yet it retains some of the essential characteristics of what and how it was made (almost like a dialectic). A work of art does not have the same kind of utility as a loaf of bread. We can compare loaves of bread for texture, moistness, aroma, flavor and so on, as well as how or if it sustains our body. A work of art also can be described in the terms of color, hue, saturation, or cadence, pitch, meter...but in the case of art what is sustained, broadened, or enhanced is our spirit..."Nutrition of the spirit"
The oldest works of art are estimated at around 40000 years old preserved in caves in various parts of the world. 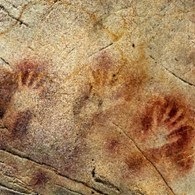 The most famous are at Lascaux in France, but they are also in Indonesia. Many of these paintings are fabulously stylized. I especially like the hand stencils that appear in these caves. It is almost like they are waving at us, 'we were here'. So, yes art is a medium of expression and expression is an essential characteristic of man from the get go. Understanding this "vague" term is the challenge. That challenge goes beyond, painting, music, sculpture...into our virtual world, where new concepts (or transformation of existing concepts) of what comprise art art are emerging. They may or may not. Art is just a concept, and as such it can be applied to practically anything. Framing something as art is like an invitation to view a subject in a new or aesthetic way, where we might appreciate what has been previously taken for granted, see new or renewed meaning, or perhaps generally expand our conception of a subject (as I think you mentioned). I'd say it's going beyond the rational but practical rationality is actually rather irrational, I'm beginning to understand. I encountered a new set of notions out of the post-modern camp a few days ago (i guess it's not all bad!) which describes the essence of art almost exactly as you've formulated it. Russian "Defamiliarization" (ostranenie), German "Distancing Effect" (Verfremdungseffekt), and Derrida's "Difference" (Différance). It takes what is real by virtue of familiarity and presents it in an unfamiliar, magnified, or distorted way, thereby causing new perceptions and perspectives to emerge in the consumer. This may not be the precise definition covering all "art", but it's a good start toward defining "good art". A good work of art is designed to induce a reaction within the individuals who observe it. You can love or hate the work art. The induced reaction is important. Art is a way to trigger the unconscious mind of the audience. The creative energy for the art, comes from the unconscious mind of the artist. The good artist builds a bridge between his unconscious mind, and the unconscious minds of his audience. The unconscious minds of the great artists, anticipate the future, and can convey this vision to others though the art; unconscious bridge to the future. For example, art during the industrial revolution, changed from photographic clarity, to the fuzziness of impressionist art. This change paralleled the shift in culture away from the historical farm life, based on centuries of pastoral repetition, to unprecedented factory life. The industrial revolution had an impact on human nature, making things fuzzy. The art movement anticipated this change. Abstract art, which came next, anticipated other changes in culture, made by theory like relativity and uncertainty, where cause and affect became distorted; determinate versus indeterminate. The artists unconsciously sensed and/or anticipated the change, and helped make it conscious. Idol worship has a connection to the unconscious art affect. The golden calf was a good work of art, that had power over some people, due to its unconscious induction affect. The ancients would project the induced feelings, as coming from the work of art; god in the art. The induced affect was inside them all the time. The art made it conscious. A new car has an art affect, in the sense it induces a feeling of importance. One modern artist from the 1950's. who was prophetic of now was Escher. He has a work of art called Relativity. In this work of art, there are people climbing staircases at all angles. If you look at any particular staircase, the reference appears fine, by itself. However, if you look at the bigger picture, all the references cannot exist at the same time. The trick behinds this affect is connected to creating an illusion of 3-D, using 2-D; flat paper. A 3-D illusion can exist in 2-D, but it will not exist in actual 3-D. I can draw a ball on a flat piece of paper to look 3-D. But it you touch it with your finger you can feel it is flat. It can fool the eye but not touch. Logic is based on cause and affect, which is 2-D (x,y). Logic can create spatial illusions which look 3-D to the eye, but which do not exist in 3-D. One such affect is connected to special relativity. Einstein defined three parameters in special relativity; relativistic distance, time and mass. However, most of physics only uses space-time and ignores relativistic mass. This downgrade from 3-D to 2-D, allows 3-D illusions in 2-D. If you include mass; energy balance, the illusions are easier to see. If it is so, why does art play that role? Why is art the way it is? The same way and role that the peacock's feather plays. It encourages mates to choose them because it shows fitness. Art is everywhere, even if it is not called art. The new 2018 summer clothing styles are a type of art. This is art you wear. Good art induces an emotional reaction. New clothes induce positive feelings. Designer clothes give the best buzz. The former is individual and the latter is collective. The golden calf affect; god in the art, can induce unconscious projection, so one feels better if surrounded by the god in the clothes. The tribal hunter will wear the skin of his prey, to acquire the spirit of the animal; golden calf affect. The skin is not a god, but a trigger to what is inside of us. The reason this affects works is the unconscious mind is the original instinctive mind. Modern humans have become unnatural due to willpower and choice. There is a sense or need to return to its roots. Art brings us there, while culture swings the pendulum the other way. Fashion needs to reboot constantly to trigger the feelings since they are temporary. Some art brings the individual back to their roots for a short time, while other art brings the herd back, or warns the herd that there are hazards to instinct, ahead. Shoes are a common female art induction. Shoes fit on the feet, which touch the earth. Shoes are connected to natural instinct; of the earth. The problem is the golden calf induction is not permanent, but needs to be rebooted constantly; new shoes, since culture pulls women the other way, away from natural instinct. The shoe girl is often the cultural girl, not the natural girl. She has more unconscious potential for the trigger.